1 x Sikorsky S42 Flying Boat "In Flight." 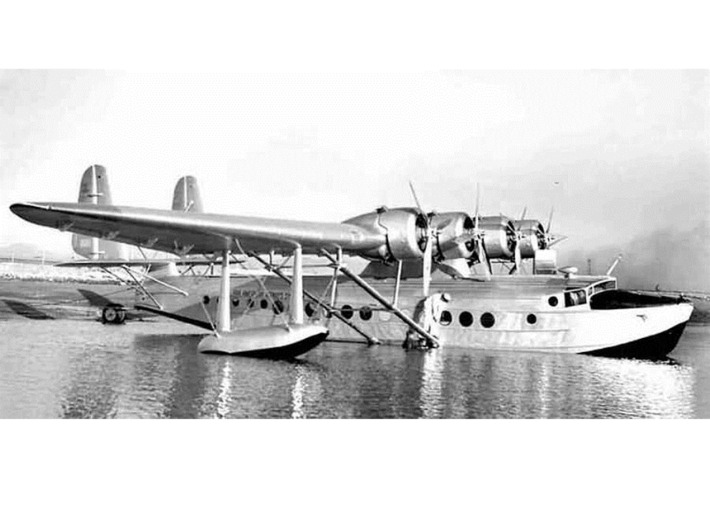 1 x Sikorsky S42 Flying Boat with Beaching Gear fitted. 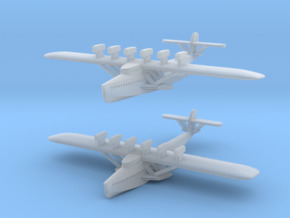 1 x Sikorsky S42 Flying Boat Waterline Model. 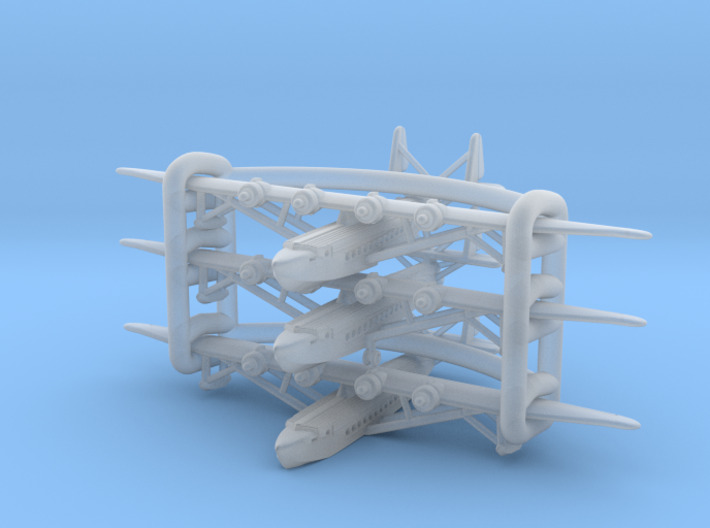 Please note that the individual items are supplied "caged" together to avoid loss and damage - after the cage is removed there are NO sprues to cut away from the models. 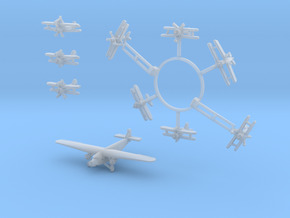 Each 1/700 scale plane has a wingspan of just 51.5 mm and is 29.6 mm long - 61.1 and 34.5mm in 1:600. 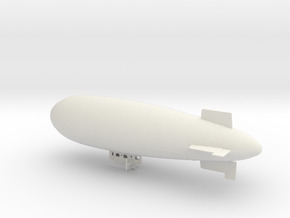 The In-flight model has a nominal 1 mm diameter hole in the hull for a mounting rod. After being flight tested by Pan Am's chief test pilot Edwin Musick and technical advisor Charles Lindbergh, the first S42 entered service on August 16 1934. This was on Pan Am's Latin American routes out of Miami, and two days later the plane was christened Brazilian Clipper in Rio de Janeiro by the wife of Brazilian president Vargas. The new plane cut the travel time from Miami to Buenos Aires down to just five days, compared to the eight days required by the S-40. The S-42 was used extensively on Pan American’s Caribean and South American routes and became a familiar sight at Miami’s Dinner Key terminal. More from www.clipperflyingboats.com . . . The S-42’s incorporated several important technological innovations. 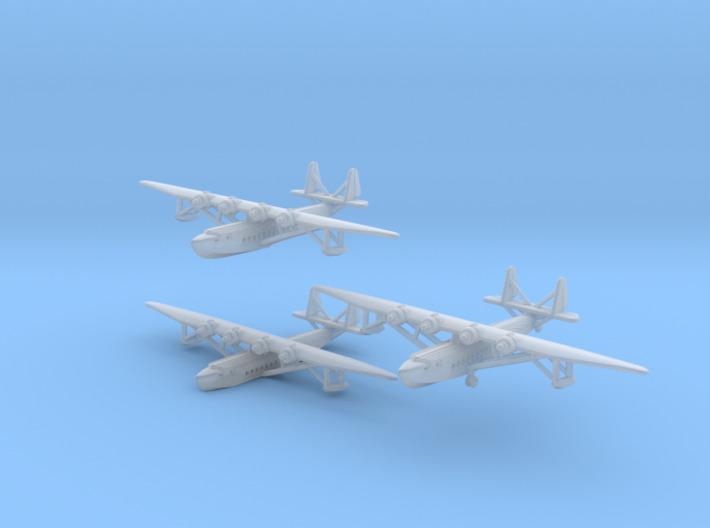 The plane’s all-metal construction, using the new aluminum allow known as duralumin, provided the strength and structural integrity to lift a remarkable payload of fuel, passengers, and cargo. To support that payload while providing the high-speed needed for fast cruising over long distances, along with stability in rough weather, the S-42 was designed with a remarkably high wing loading of 28.6 pounds per square foot; the wing loading of the S-42 was more similar to that of a high-performance racing plane, and was more than twice the wing loading of the Ford Trimotor, the most popular American airliner of the day. 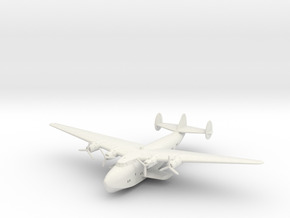 Such a high wing loading required other significant innovations, including a highly efficient airfoil, hydraulic flaps to lower takeoff and landing speeds, and newly-designed variable pitch propellers to provide both high power during takeoff and fuel efficiency during cruise.